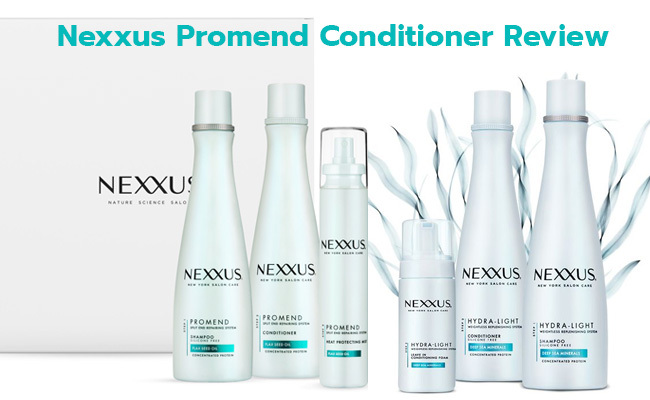 When is it time to use Nexxus Promend Conditioner? Why is its formula different? How to get the best out of it? How does it feel on your hair? What are the best parts about it? Does it have major flaws? Split ends, frizz and strands forever tangled is something you never want to have to deal with so whenever you get the chance of solving these kind of problems, take the leap of faith and try only the very best. The conditioner should be the 2nd step of your typical hair care routine. It’s a split-end binding conditioner that rebuilds a protective barrier to your hair, sealing split. The formula helps the conditioner realign and seal the split ends, for easier manageability of the hair. It uses an advanced conditioning technology so that it protects the hair from future splitting. You may want to use it whenever you want your hair to be smoother, better conditioned and flexible in a natural way. Which is all the time. The conditioner includes several ingredients that are so efficient when it comes to smoothing the hair, eliminating frizz. Using the targeted micro-silicons that deposit only when your hair fibers need them, the conditioner is able to rebuild the barrier that protects your hair. It conceals the nourishments inside your hair, which makes the hair fiber smoother. It doesn’t coat your strands with any residues whatsoever so your hair remains flexible and well balanced. Not only the formula includes flax seed oil, but also concentrated elastin protein, making the conditioner way powerful. Flax seed oil- even though more research needs to be done when it comes to the flaxseed oil benefits on hair, it’s beyond the doubt that this ingredient comes with many benefits for the hair’s health. It’s highly concentrated in antioxidants so it minimizes the risk for damage at the cellular level. This actually translates into healthier and stronger hair. Additionally, flaxseed oil is also loaded with omega-3 fatty acids that sustain the growth of strong and healthier hair right from its roots. The lignans, a chemical compound within flaxseed oil, stop the production of the enzyme that converts testosterone to DHT. Long story short, less DHT means actually better hair growth. Hydrolyzed wheat protein- it’s a great ingredient that increases the elasticity of the hair and protects the cuticles from future damage. It hydrates the hair and has impressive conditioning abilities. Thanks to its formula, the conditioner nourishes your hair and eliminates the split ends. Its binding technology seals up almost 90% (86% for more accuracy) of split ends. It repairs the broken hair fibers and leaves each strand smoother and softer. The conditioner is part of the Split End Repairing Sytem, ensuring a recently cut look to your hair. As the conditioner rebuilds the nutrients only to make your hair smoother and softer, it also offers rich moisture beneath the surface. Therefore, the conditioner repairs, rejuvenates and replenished the hair, increasing its natural movement. You should use the conditioner as Step 2 in your hair care routine, in order to get softer, smoother and easier to style hair. The conditioner works without weighing down your hair. You can use it daily, onto your wet hair. Let it rest for 3 minutes or so before you rinse your hair. If you’re looking for a deeper treatment, you should use the hair masque from Nexxus Humectress. The conditioner has a great smell that doesn’t linger for very long, so you may combine it with other cosmetic products. It detangles very well your hair, leaving it easier to manage and softer. The conditioner comes very well packaged and is fairly easy to use. The conditioner has many benefits for the looks of your hair and even its inherent flaws don’t make us change our mind about it. The conditioner is a great option when you’re trying to soften, detangle or smooth out your hair. It takes care of the split ends and makes your hair easier to manage for styling, leaving a great smell too. And all of these points sure make out for the minor flaws. Check out our other conditioner reviews: Deva Curl Ultra Creamy Conditioner.